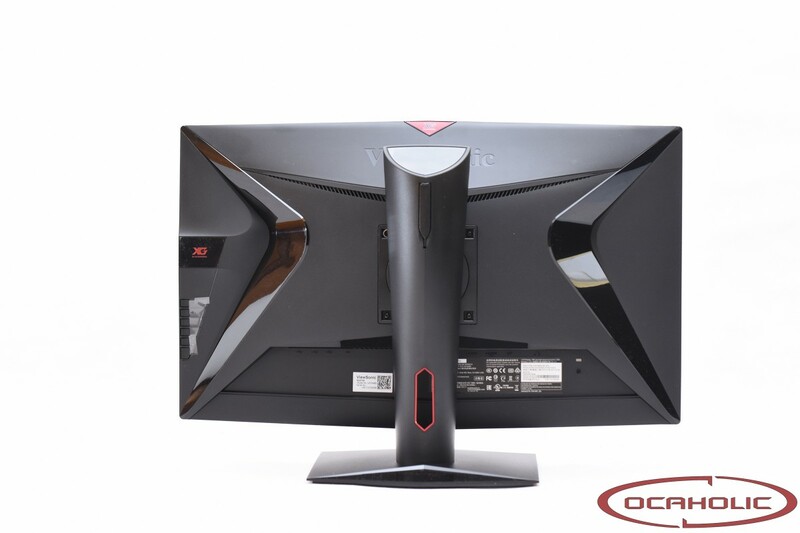 These days gaming displays or generally gaming components feature visually more aggressive looks and the XG2730 is certainly no exception in this regard. There are lots of edges and corners and almost no round shapes at all, which makes the design look aggressive to a certain extent. 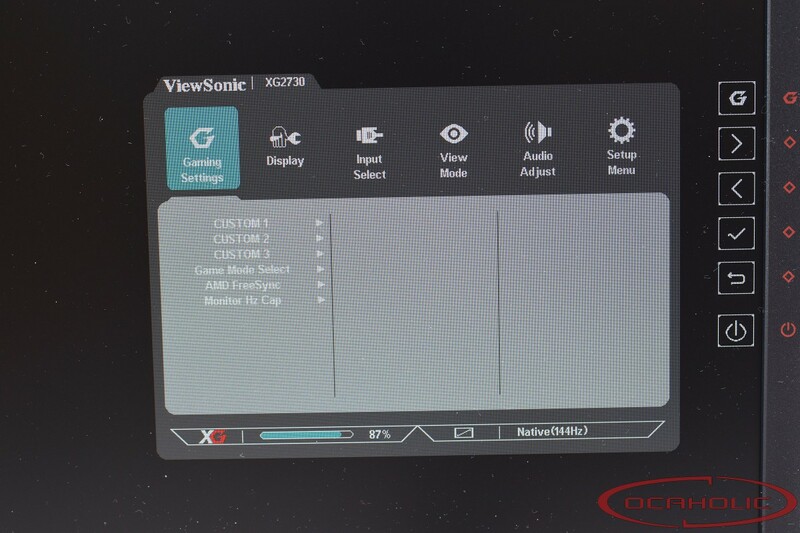 It's great to see that Viewsonic was able to create a uniform design language for all its XG Gaming products. 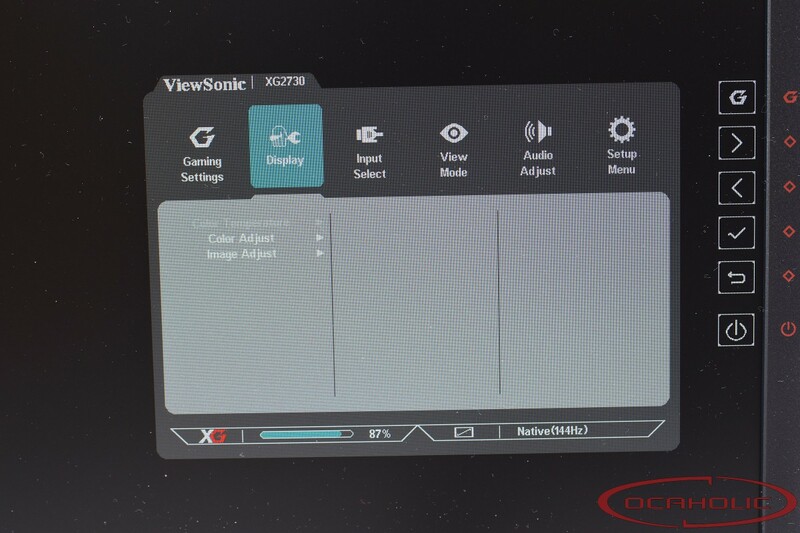 In the case of the XG2730 display there is a frame, which is about 1cm thick and therefore Viewsonic is not putting a frameless design in place with the model. 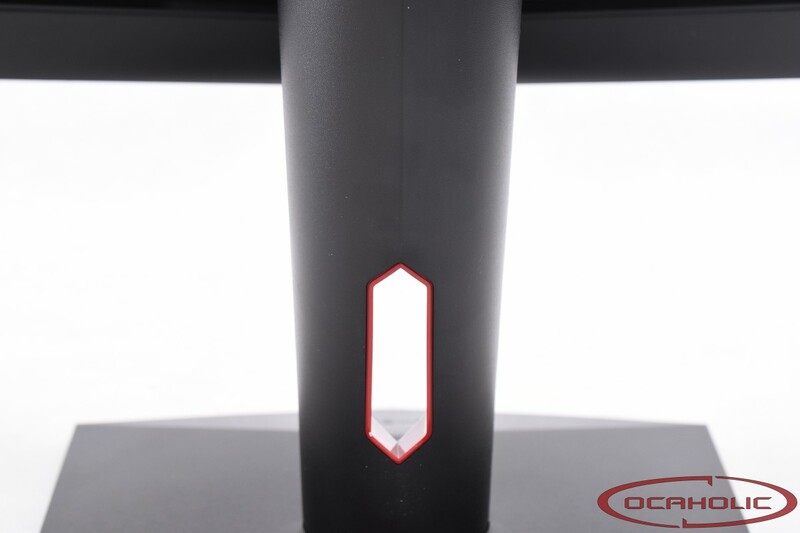 The bottom edge has been equipped with a red colored bezel, which prominently displays the XG Gaming writing. Having a look at the back shows a curved, plastic surface covered, which has been covered using matte plastic. We like to see this sort of plastic since it's less prone to scratches than its glossy counterpart. Another design element in the case of this display is its foot. The base solid and heavy, offering good stability and a very safe stand on any table. Furthermore the stand offers pivot, tilt, and height adjustment. 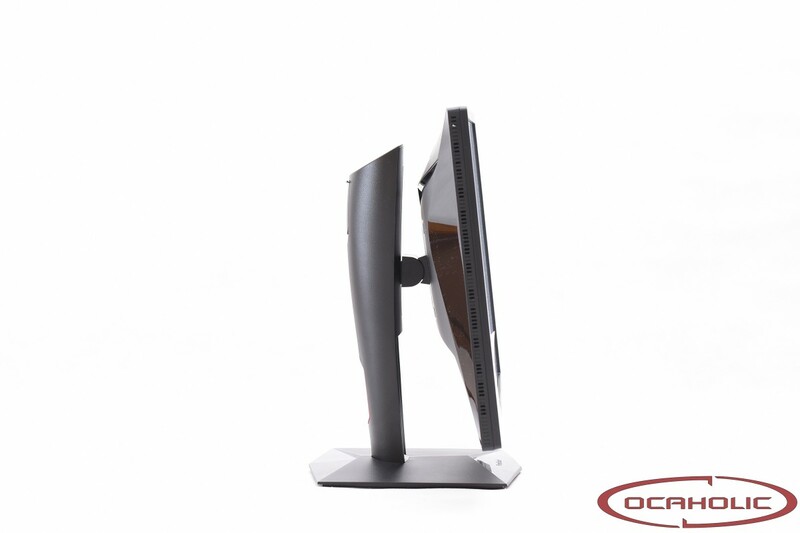 Especially due to its adjustability the XG2730 is a monitor that's comfortable to use. As we already mentioned there is a solid foot making it stand safely on any table. Apart from that there is the weight of 10 kilogram, which is not particularly high, but enough to make gravity do its job. In combination with the well-balanced weight distribution the XG2730 can be tilted by up to 15 degrees. What we always like when we see it and what can't be found with every gaming display is a VESA mount. 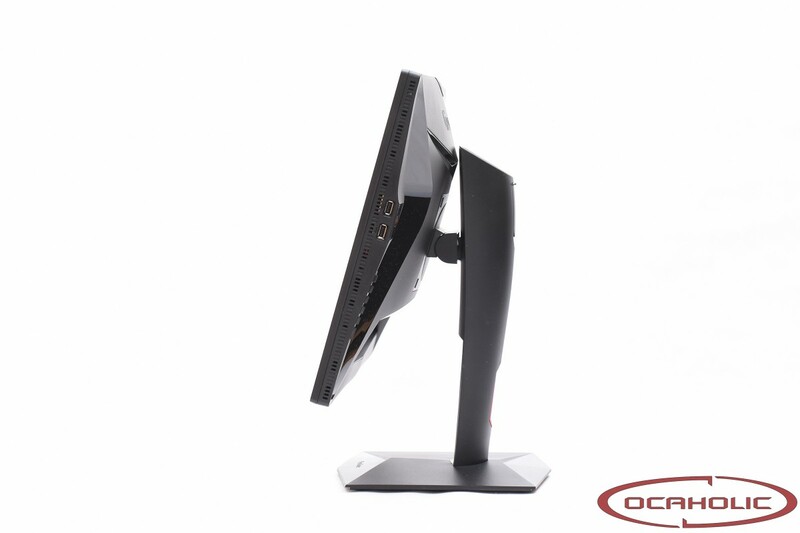 The OSD can be managed, using five buttons, which have been placed vertically on the right hand side. The button's functions have been marked on the frame with different symbols. There is also a sixth button, which is the power button. As illustrated with the picture below four of the buttons have been marked using the same sign, therefore the control is not intuitive right from the beginning. This is a bit frustrating and the user experience isn't the greatest. In combination with the buttons, which are sort of hard to push the whole OSD feels somewhat clumsy. Apart from that there is some input lag when pushing a button, which means you might end up pushing a button twice before something happens. Overall it will take some time getting used to this menu and you better bring some patience to the table. Funcionality-wise the OSD itself offers a variety of differen options as well as gaming profiles. 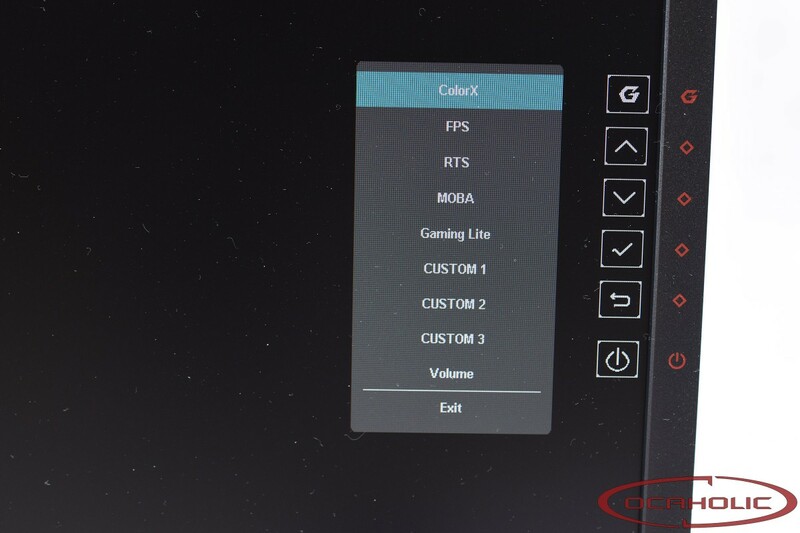 The G-button can be understood as a shortcut allowing you to browse through pre-defined profiles and therefore brings you directly to the OSD's "Game Settings" page in the menu. In total there are six different profiles from which you can choose and since the XG2730 is a gaming display, three of them have been dedicated to gaming. 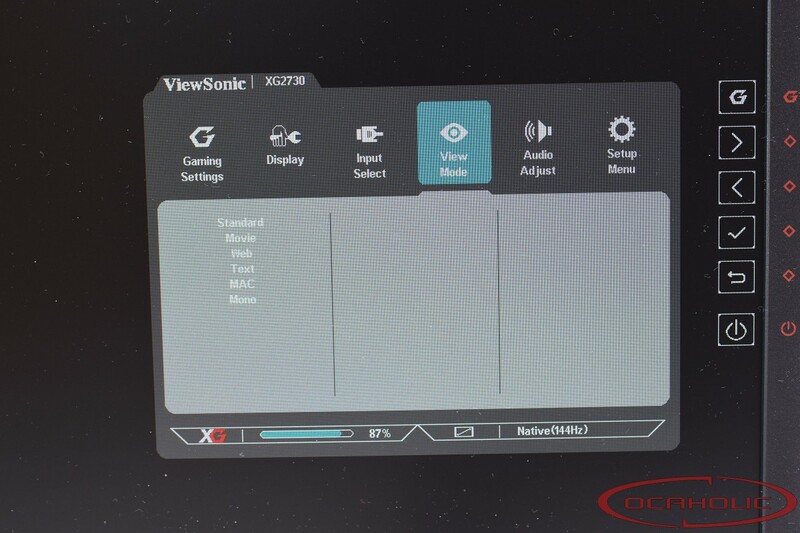 The second menu page allows for changing display related settings such as brightness, contrast, ... and on the third page you can cycle through the different inputs. The fourth page allows you to enable/disable the built-in speakers. Last but not least there is the setting menu where you can browse through options such as language, auto power, ECO mode and sleep.